GET READY TO BLOW YOUR MIND! Prepare to ascend to new dimensions as you experience 10 all new mind blowing 3D animated special FX videos synchronized to the worlds leading dance floor hits. 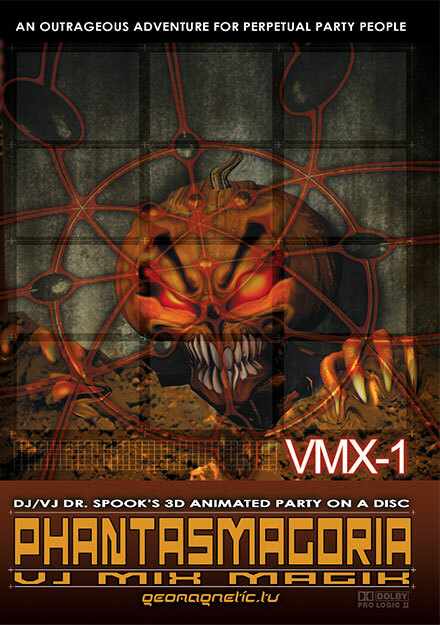 Originally released on CD in Europe and Japan on the cutting edge dance label Geomagnetic Records, Doctor Spook’s classic hit compilation “San Fran Psychos1: Phantasmagoria” spotlights 10 of the hottest new dance music producers emerging from the underground clubs, warehouses, and outdoor events in the SF Bay Area. This music is a fusion of acid trance, deep tribal beats and uplifting melodies well known around the world as “GOA” or “PSYCHEDELIC” Trance. Featuring the scenes hottest artists and expertly mixed by world renowned DJ/VJ Doctor Spook, engineered and mastered by Chromatone + Random. Now Geomagnetic.tv is proud to present a new step forward for this classic album and trance music in general with this stunning DVD. Experience Doctor Spook’s mind mending full power visual music presented in Dolby AC3 Pro Logic Surround Sound. This Haloween themed compilation of Psytrance artists from San Francisco blends dark, funky, atmospheres with deep groovy and spooky melodies. Each track fits together with the next to create a mood and feeling of ominous depth. All of the tracks have been tested on the dance floors to combine the essence of ferocity with the spice of danceability to produce a soul clenching trip that you will never forget! Vetern Psytrance wizards combine with some fresh new talent to keep you on the edge of your sanity until the sun finally rises once more! This comp firmly announces the power and style that come from the San Francisco area's underground psy-scene! DJ/VJ Doctor Spook (a.k.a.Nathan Vogel ) spends most of his time creating a wide variety of cutting edge digital projects including Maya 3D animations, music videos, VJ graphics, DVDs, video games, motion graphics, feature film special FX shots and original computer animated shows. Doctor Spook is an internationally renowned psychedelic trance DJ/VJ who is also starting to write his own brand of psytrance music as Mindstorm. He recently did the 3D HD background VJ visuals for Elton John's 60th Birthday Party at Madison Square Garden that was broadcast on national TV several times in April of 2007. And he played two big VJ/DJ sets at the Bonnaroo Music Festival featuring The Police reunion and The White Stripes in June of 2007. The first Mindstorm CD and DVD will be announced soon. Doctor Spook has a trance record company called GeoMagnetic featuring CDs and DVDs full of fresh electronic music from around the globe and 3D Minds Eye type music videos. He also has a new distribution company called Crystal Code with over 3000 electronic music CD and DVD titles. The latest "GeoSpirit1: Virtual Vortex" DVD features over 60 minutes of new original 3D Maya footage set to eleven fresh trance songs, five of which Doctor Spook helped write. Click here to watch and hear this DVD online along with some other new ones! GeoMagnetic has now shifted into DVD mode and will be releasing about 20 new VJ style 3D experiences in the next few months. The "Deep Step" music video from the Magnus DVD is a featured case study in Sherri Sheridan's new microbudget digital storytelling book "Developing Digital Short Films." Doctor Spook and GeoMagnetic have become pillars in the local San Francisco trance music community by throwing many parties and events throughout the year all over California and beyond. And he has not missed a Burning Man since 1996 where he can be found doing sets at various camps all over the playa each year. Some of you may know Doctor Spook from his interview in the now cult classic DV documentary film Liquid Crystal Vision exploring the worldwide trance music scene. Nate is a certified Maya Trainer for Alias and has taught thousands of students from around the world to realize their visions using all sorts of software. He has taught computer animation at Siggraph, The Academy Of Art College, Mesmer Animation Labs, The Center For Electronic Art and San Francisco State University. Nate is the co-author of the first big Maya book called "Maya 2 Character Animation" published by New Riders in 1999. He won the "Best Music Video Award" in 1998 for "Beyond" by Geffen's Young American Primitive at the World Animation Celebration in Pasadena. "Beyond" world premiered and toured with the ResFest Cinema Electronica in 1997. His award winning animations are featured on several leading industry reels including Siggraph, Alias, and The Mind's Eye. In 1992 Nathan Vogel won the MacWorld Quicktime Festival for his legendary four minute film "Media Man In The Net" one of the first all digital short films. "Media Man" was created on an Apple LC, with a Yarc board using Macromind 3D, COSA (After Effects) and Renderman. He was only 19 at the time and heading up all of the computer animation and digital video classes at San Francisco State. Nate then went on to become the 3D Special Effects Director at a start up company called Media Bytes in San Francisco where he created the award winning Neuromancer Opera footage from Bill Gibson's famous book using Wavefront & Explorer on the SGI platform.